Buy a 7 Night Stay in a Studio Unit at Lifetime in Hawaii in Honolulu, Oahu, HAWAII! Lifetime in Hawaii in Honolulu, Oahu, HAWAII - Buy a 7 Night Stay in a Studio Unit for up to 4 Guests! 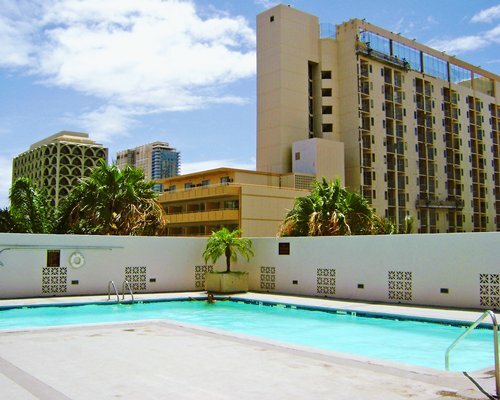 Enjoy 7 Nights in a Studio Unit at Lifetime in Hawaii in Honolulu, Oahu, HAWAII! Lifetime in Hawaii at the Royal Kuhio Condominium boasts one of Waikiki's most fashionable vacation addresses. Located on the 22nd-27th floor of the Royal Kuhio building it is just minutes from the beach, the acclaimed Ala Wai Golf Course, the shops of the International Market Place, and scores of restaurants and night spots. On the seventh-floor recreation deck at the resort, you will find an outdoor pool, putting green, saunas, weight room, and more. Oahu boasts 45 public beaches and famous Waikiki Beach is just blocks away. Lifetime in Hawaii’s 39 studio units with lanais randomly are situated on Floors 16 through 27, ranging from 445 to 538 square feet, with ocean, city, mountain, or Diamond Head views. All units have maximum occupancy for four people and privacy for two and have one bathroom, vanity area, and a walk-in shower. There are queen beds and queen sofa beds.All units have window air-conditioner, telephone, cable TV, VCR, DVD, and a balcony. There are laundry facilities on the building's seventh floor. Although Lifetime’s units are accessible to our handicapped guests, the units are not handicapped equipped per se, inasmuch as the Lifetime resort is a private entity. In addition to the regular Saturday check-in/checkout unit housekeeping, towels are replenished on Mondays and Wednesdays (if placed on the floor); there is a mid-week vacuuming service as well. Bed linens are not automatically changed mid-week, only upon request. Multiple week guests will receive full linen changes and housekeeping services on Friday. tax ranging from approximately US$20-$45 per unit/per week based on the unit type. Equipment Rental fee is 10.00 to 31.35 U.S. dollars.